A couple of weeks ago, I made a weight loss project section. It's working really well (and I'm already down 2.6 pounds), but I am trying to focus more on the exercise portion of the project lately, since I have food pretty much under control (except on Saturdays). The key to working out most days a week, for me, requires four planning steps. 1. 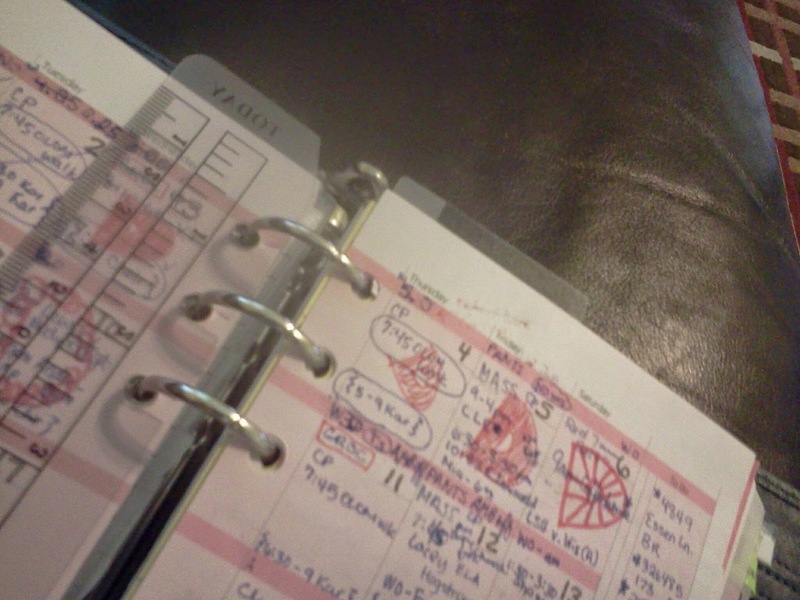 On my monthly calendar pages, I schedule a week's worth of workouts. I schedule weekly workouts on my monthly calendar at the beginning of each week. The reason I do this is because my monthly calendar holds all appointments, so I can truly determine which days have time slots when I can workout and I can make sure that I get at least four workouts (though six is the real goal) each week. Right now, I am scheduling next week's workouts. A glance at my calendar shows me three workouts that are already planned. I am walking with the moms group that I started on Facebook with some moms from my kids' school on two days. On the third day, a Saturday, I scheduled a virtual 5K with one actual other person in town and my friends from across the country who are in my weight loss group. That means I need two or three more workouts. I'll rest on Sunday (right after my kid's Saturday night slumber party), do yoga at the Y on Monday and Friday (two different classes, to account for differences in my schedule), and do a step and tone class at the Y on Wednesday. TIP: Vary your workouts to keep it interesting and challenging and to avoid injury. I do aerobic/dance type workouts, stair climbers, treadmills, weights/sculpt classes, pilates/yoga classes, and family walks in the park. I sometimes workout alone, sometimes with a class, and sometimes just with a friend. 2. The night before, I make a schedule for the next day that includes my workout along with a packing list. I write out my actual schedule and packing list the night before. In the example above, I'm working out at noon at the Y and packing water, fruit, nuts, and my workout bag. I only bring the "if needed" stuff when I have a meeting after working out. The separate wallet is so that I can bring just earbuds and water bottle with me when I use machines. 3. 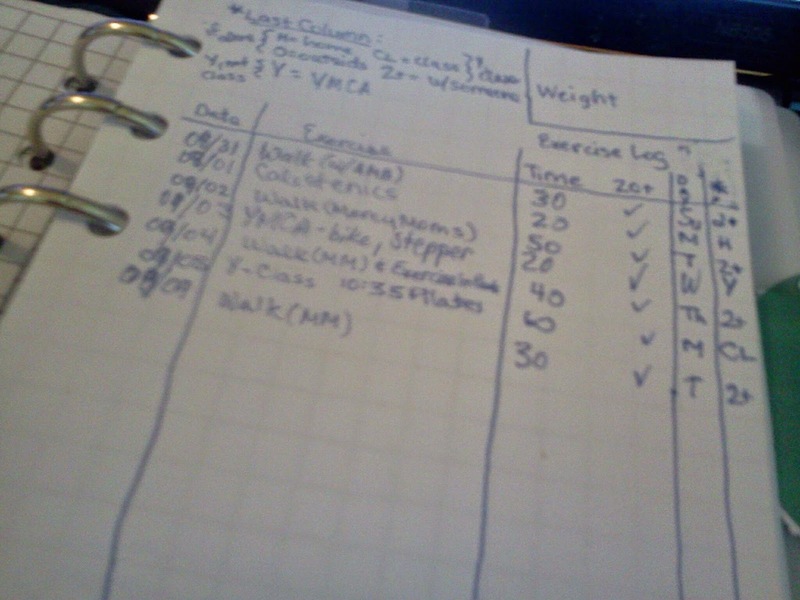 I log my workouts in my project section. 4. 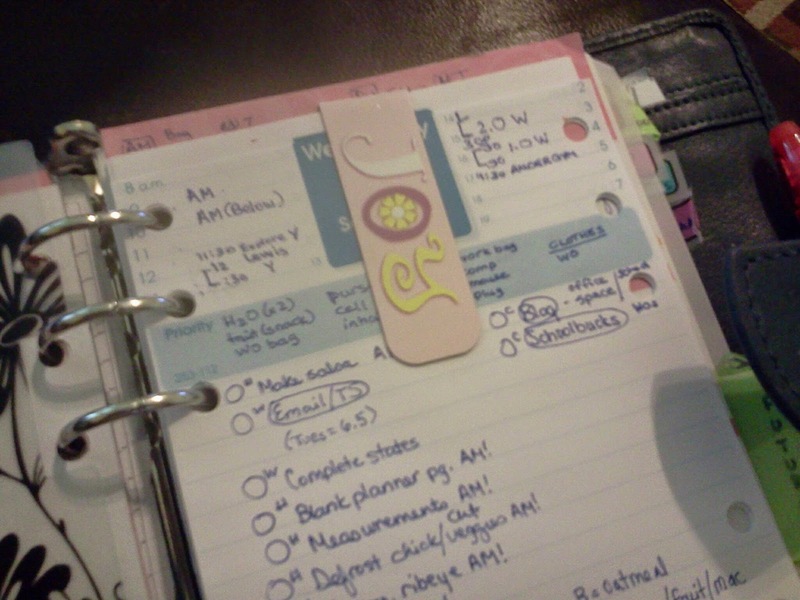 I keep resources in my planner listing things like times when the gym is open and lists of classes in my project section for easy scheduling. So four steps: monthly scheduling, day before schedule/prep, day of logging, and resources for scheduling. As you can see from my log, I'm doing a great job of working out. I am losing weight, fitting my clothes better, and feeling MUCH better emotionally. I'm also sleeping pretty well. 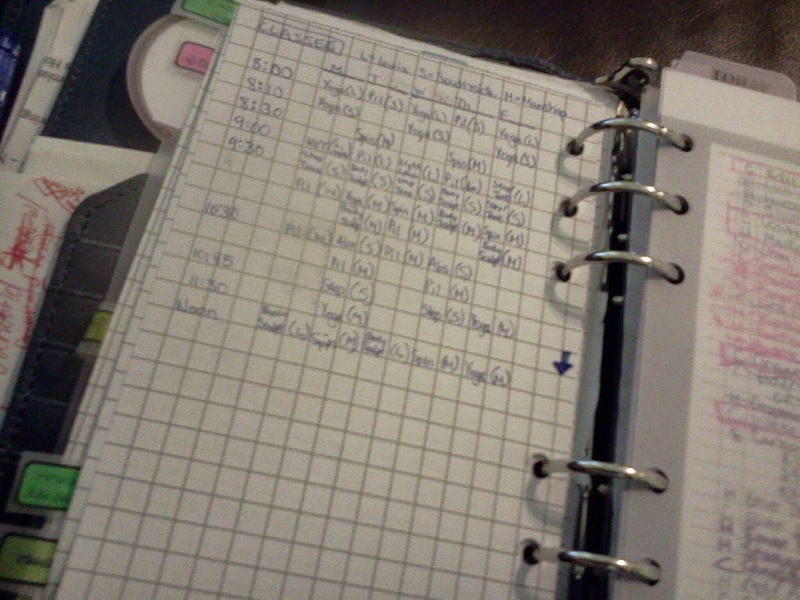 Who know that something as simple as using my planner would make this doable?